Did you know there are over 26 towns in the U.S. named Eureka or with Eureka in the name? Also a few scattered in Canada, Australia and New Zealand. 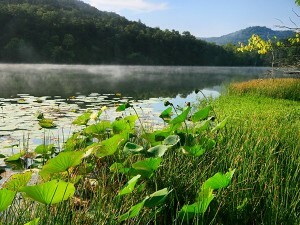 But there is only one Eureka Springs and that is in Arkansas my friends. Eureka! The word comes from the ancient Greek, “I have found it”. We also equate the word with a “great discovery”, like the discovery of gold in California or the cold water springs in Arkansas. Like most springs throughout the world, these springs were believed to cure certain ailments. First known to the Native Americans and then ‘discovered’ by the Victorian-age health seekers. People flocked to the area and eureka, a resort was born. 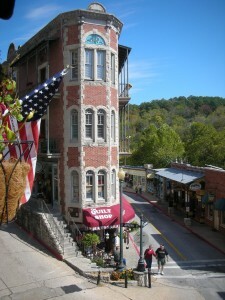 Last year we visited Eureka Springs before the PAII Conference in Little Rock. We were blown away. Quaint and bold historic buildings line the downtown streets that curve and wind upwards, down and around. We had so much fun driving and did get a bit lost and so did our GPS, but what the heck. The locals were helpful and gave us directions with a friendly knowing smile. 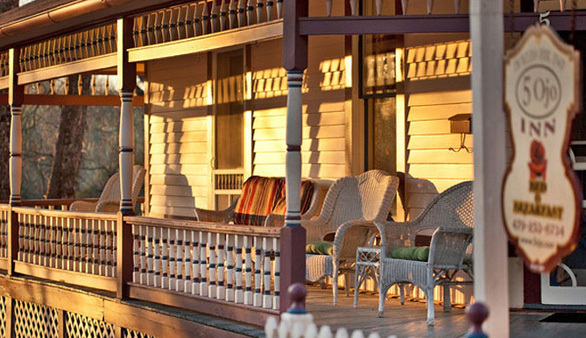 This resort town is known for its restoration and preservation so you know the B&B’s are among the best examples of the historic Victorian architecture that has been so lovingly preserved. Take a look at the Bridgeford House Bed and Breakfast. What a beautiful painted lady! 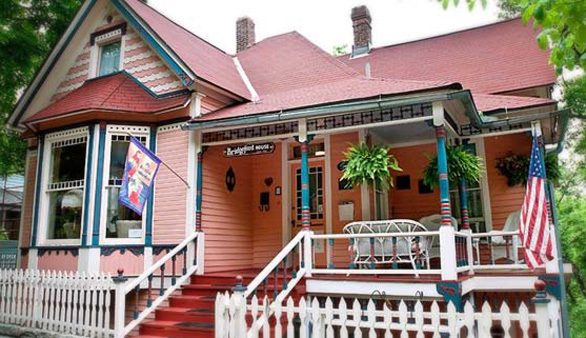 The B&B Team is offering this charming inn for sale. You can’t get any better than a property in great condition with lovely features in a destination location that attracts people from Tulsa to St. Louis to Ft. Worth, to name just a few. Believe me, this is a great place to discover if you haven’t already. 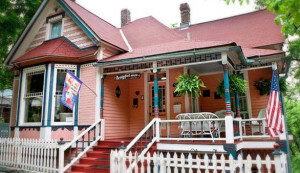 5 Ojo Inn Bed & Breakfast is another of our listings that is unique and radiates Eureka Springs hospitality and charm. The property includes two homes and two cottages with rooms that have been remodeled and re-branded and a new marketing presence in 2012, this B&B is poised for the next phase of its growth. Rick, Peter, Peggy and I had a great time. After touring the Inns and getting acquainted with the innkeepers, we all went to town. We had dinner at the Grand Taverne at Grand Central Hotel, a classic historical hotel with the classic dining room to match. Later that evening we were surprised to hear a familiar voice coming from the grand piano. 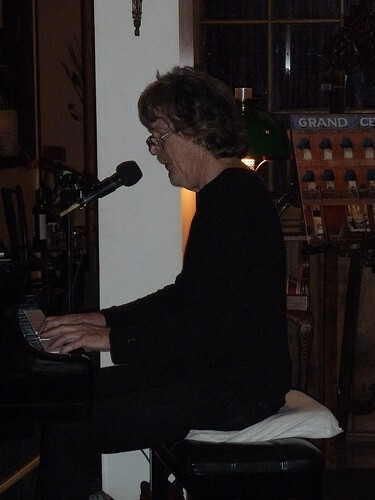 ‘Do You Believe in Magic?’, wow, Jerry Yester from The Lovin’ Spoonful. There is a wonderful purity to his voice and when he sang this song it was like he was singing it for the first time. He plays there twice a week when he is not touring. Some of you may ask, who? The Gen. Xers at the Bridgeford House breakfast table the next morning certainly did! It was quite funny to see their blank faces while we were excitingly talking about our celebrity siting. Eureka Springs really is a town for all ages, not just for us baby boomer Lovin’ Spoonful crowd. It is known for its eclectic shops, booming artist culture, restaurants and nightlife, and oh what nightlife! Places like; Voulez-Vous Lounge with jazz, champagne cocktails or classic drinks and a bit of burlesque. How about the Pied Piper Pub and Cathouse Lounge? (Yes Eureka Springs has a very interesting sorted history that involves underground tunnels). Walk or take a taxi back to your quiet B&B. Fun, friendly and safe. The Eureka Springs promise. There are many finer dining restaurants and the innkeepers of 5 Ojo have rated their favorites on their website. Gaskins Cabin Steakhouse is one that is at the top of their list. The area is also a destination for recreation with access to two lakes, zip lining in the Ozarks and the Great Passion Play performed in a grand outdoor theatre. As they say, something for everyone. 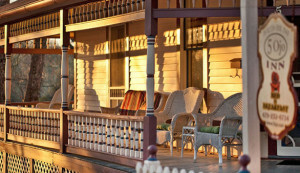 Looking for a great location for a B&B and a great lifestyle? Check out the Bridgeford House and 5 Ojo. You couldn’t ask for more beautiful places to settle down into your new innkeeping life. A great discovery, a great place to live! This entry was posted on Wednesday, April 10th, 2013 at 8:19 pm	and is filed under Better Way to Buy and Inn. You can follow any responses to this entry through the RSS 2.0 feed. Both comments and pings are currently closed.